As some of you may know, my wife is an amazing shopper. She gets 5 Sunday papers and cuts their coupons out. She is a magician at finding great deals at garage sales, consignment stores and clearance sections at stores. Well, a few weeks ago my wife came across something called Bountiful Baskets. And today was our first day trying it out. They have website where you can get all of the information, but basically it is an online co-op where communities of members buy produce collectively. 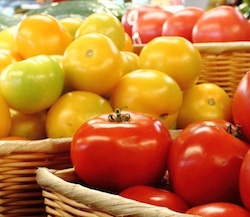 The idea is that you get fresh, quality produce, save time and money and support local growers. Here is what happened. We showed up a few minutes early, and there were only 3 or 4 people waiting for it to start. The volunteers that day had the presorted baskets lined up and queued for us to get. And another had the list of names on her clip board. When we started, they checked our names, and gave us our fruit and veggies. The whole process took less than 5 minutes. One Bountiful Basket costs $15. I looked at the basket of produce and wasn't sure what to think. We had some onions, potatoes, asparagus, a pineapple oranges, and so forth. They tell it is will be different each time depending on what is available for the best prices. And I was curious at just how good of a deal we had made. I am all for supporting local growers, and getting quality produce, but not to the point to pay more for it. So I made a list of what we had in our basket and took it to a grocery store that also has good prices. My wife and I collected as close as we could get to the same produce from the store and totalled it up. If we had purchased it at the store, we would have been paying $23 before taxes. And that was all it took for me to be a convert. I will be doing this comparison for the next few weeks as we get more produce this way, but if this is the standard savings, it is well worth getting up and spending a few minutes on a saturday to get fresh food. And if it gets even more impressive in the summer and fall as more local produce is available, well then you can expect more posts praising this group.